New Venue for Ukalaliens Classes in Olympia! Kate and I visited the Olympia Center (222 Columbia St. NW) yesterday to investigate the possibility of teaching our uke classes through the Park, Arts, & Recreation Department. We had a wonderful conversation and tour of the facility with the public service rep, André Drummer, and proceeded to reserve a “beautiful windowed” room for our September classes in Room 200. As of now, Room 200 will be our new location for Ukalaliens 1 (New Ukalaliens/Level 1) and Ukalaliens Woodshed (Level 2). The room is on the corner of the second floor and the stairs (or elevator!) take you right there. We hope to teach our “Ukalaliens Level 1” class through the Parks & Recreation Department for the winter term but for now, please register online through the Quality Folk website. The move to this location will increase satisfaction and enjoyment (and view!) for our students. It also increases our expense to provide it. We appreciate your support very much. Our success in our new location depends on sign-ups so please, please, please encourage your friends and share our information for all to explore the ukulele with us. We will use the same format, materials and content as in the past along with new songs to add to the mix. We will both, Steve and Kate, teach the September classes together. Thank you for spreading the word about the song circle and our uke classes! We have a lot of good news to share with you – more soon! Traditions Fair Trade Cafe at 300 Fifth Ave SW, Olympia, WA 7PM, $10 (5/21, 6/18, 7/16, 8/20, 9/17, 10/15, 11/19, 12/17/2012.) Please join us. Doors at 6:30. Ukes Without Borders! 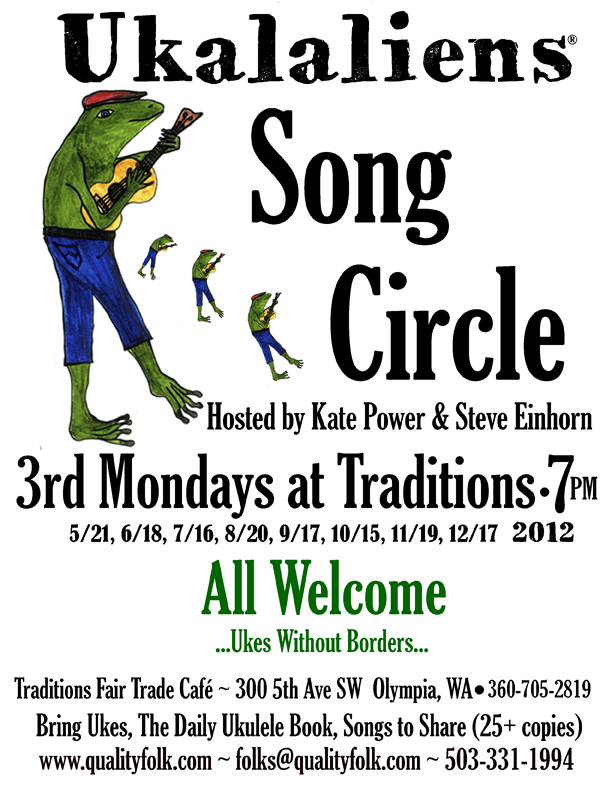 Kate & Steve will facilitate a Ukalaliens Song Circle at Traditions Fair Trade Cafe on 3rd Monday evenings. 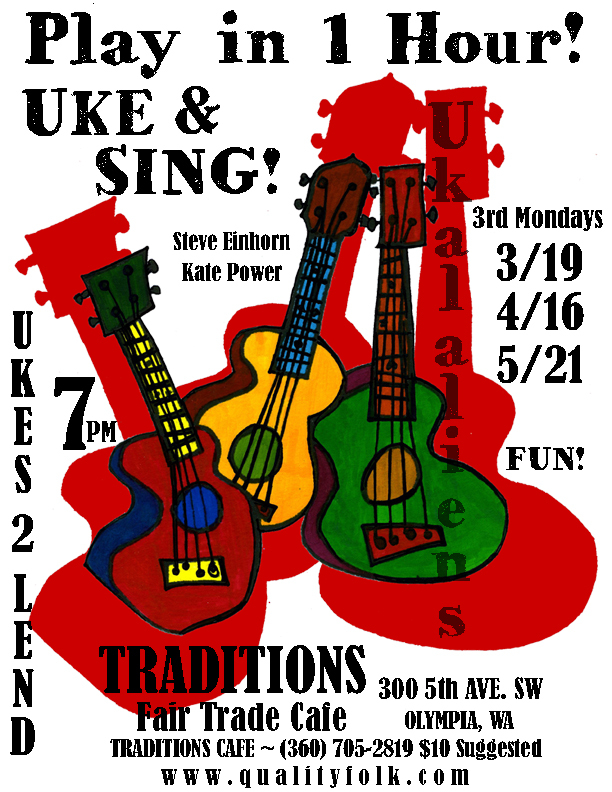 Ukulele players are invited to join us (other instruments welcome) for a monthly 3rd Monday evenings of ukulele music, songs and community. 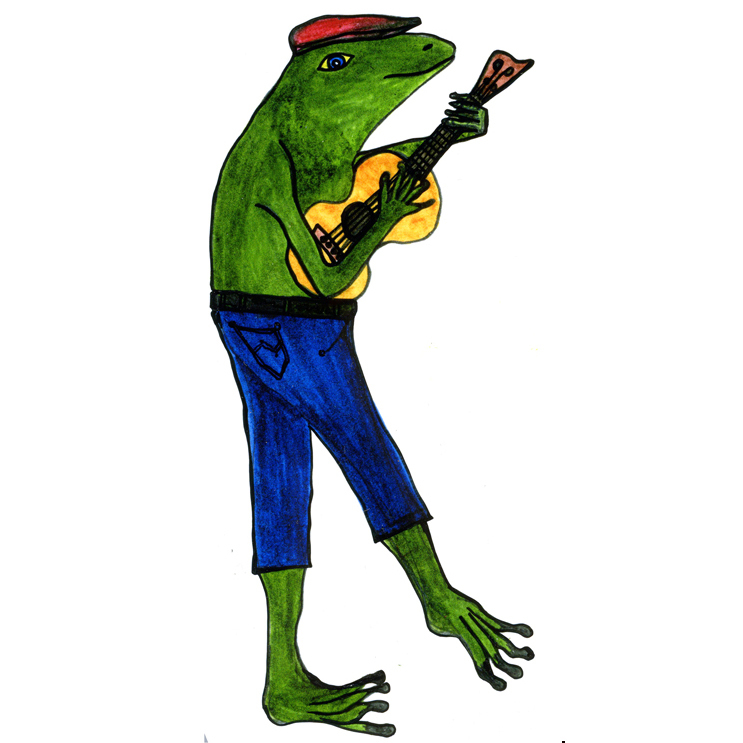 Bring your ukulele, a music stand, refreshments, The Daily Ukulele (if you have a song to share, please bring 25 copies for participants) We expect to have a rollicking and wonderful time in the heart of Olympia over ukes, tunes and songs! Please join us. Harmonize community and lift your spirits, ukalaliens style!